New Traditions Home & Realty, LLC is a second generation home builder. 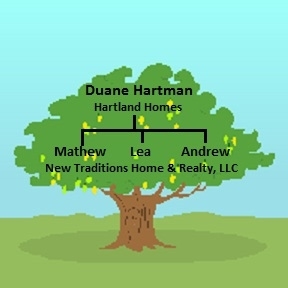 Our father started Hartland Homes in 1984 with the idea of making homeownership affordable. He did that by cutting out the "middle man", both on the development side and on the sales side, and by paying points and closing costs. Hartland Homes fast became Lincoln's largest home builder. Fast forward to January 2011. Duane is retiring and is ready to pass the "reins" on to his children. Thus New Traditions Home & Realty, LLC was created and is ready to continue the family business of home building, land development and real estate.